It's 03:28 in Honolulu, USA right now. Oahu's South Shore Surf Cam from Ward Village View current surf conditions on the Ward Village surf cam. 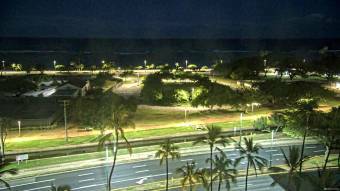 Our webcam overlooks popular Oahu surf spots from Ala Moana Beach Park to Kewalo Basin. Honolulu, Hawaii: Diamond Head, 0 miles away. Honolulu, Hawaii: Weather in Honolulu, Hawaii - Kalaepohaku Sky, 0 miles away. Honolulu, Hawaii: Weather in Honolulu, Hawaii - Manoa, 0 miles away. Honolulu, Hawaii: Weather in Honolulu, Hawaii - Waialae Nui, 0 miles away. Waikiki Beach, Hawaii: Waikiki Surfcam, 1.1 miles away. Waikiki Beach, Hawaii: Waikiki Beach Marriott Resort, 1.1 miles away. Waikiki Beach, Hawaii: Hyatt Regency Waikiki Beach Resort & Spa, 1.1 miles away. Waikiki Beach, Hawaii: Coastal Panorama, 1.1 miles away.